Sedona – come for the red rocks, stay for the experience of a lifetime. This landscape has some of the most breathtaking scenery in the world. 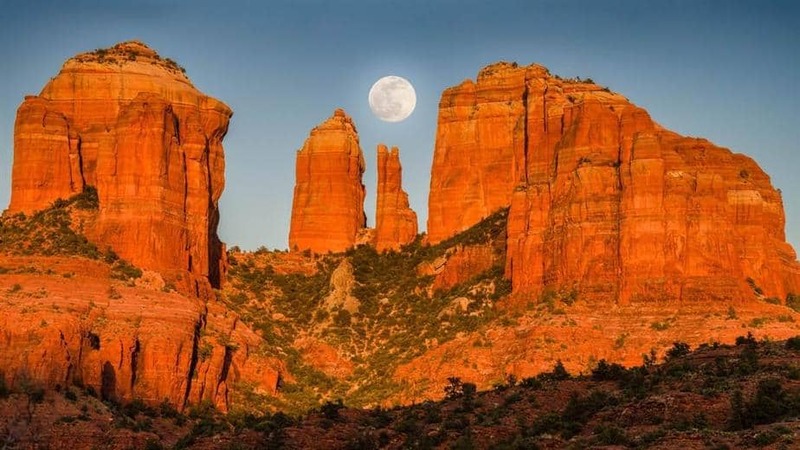 Home to its namesake red rock formations, Sedona is a great place for photographers, mountain bikers, nature enthusiasts, and, of course, hikers. 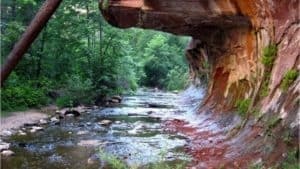 This area includes hundreds of miles of Sedona hiking trails, and while you likely won’t have time to see them all in one trip, you will likely want to keep coming back to visit the Sedona red rock area time and time again. 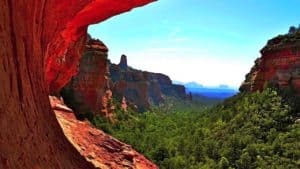 We have recapped the best Sedona hiking trails and highlighted the top things to do and see (as well as the places to stay!) while you are there. Safe for Kids: Yes, with experienced adult supervision at all times. Directions: The main parking area is located on FR 152. You can alternatively take the Chuck Wagon Trail by parking at the Dry Creek Vista parking area. Description: Devil’s Bridge is one of the greatest geological formations in the Sedona Red Rock area. It is an absolute must-see spot for hikers. To get to it, you need to hike about a mile up the Chuck Wagon Trail to reach the Devil’s Bridge Trailhead. Do not drive up it, though many try! 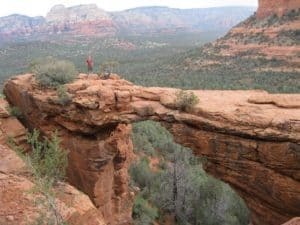 While this trail is not the easiest, nor the hardest, trail around, Devil’s Bridge has some of the most jaw-dropping views. It ends with a view of Sedona’s largest natural sandstone arch. You can even walk across the arch to take some photos! This is not a challenging hike, but there are some steep spots and rock-scrambling necessary. Directions: Starting at L’Auberge Resort, turn right onto 89A and follow it for 10.6 miles. The West Fork Trailhead parking area is on your left. 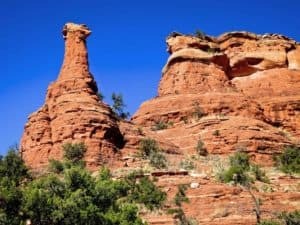 Description: This trail has the reputation of being one of the most iconic in the Sedona Red Rock area. It includes towering cliffs, breathtaking water features, and ruins of Mayhew Cabin. This cabin was built by “Bear” Howard in the 1870s. This man earned his name by supposedly killing four bears with only a hunting knife. The cabin was later turned into a lodge, which operated until 1968 and housed many of Hollywood’s elite. After burning down, the lodge maintains a special presence in the area. West Fork is an especially refreshing trail in the summer months. It is shade and filled with enough water to make it a relaxing trip. Directions: From the Cathedral Rock trail, hike .3 miles off the Back O’Beyond Road. To get to the Cathedral Rock Trail, follow the junction of Routes 89A and 179. Take 19 south about three and a half miles before reaching Back O’Beyond on your right. The trailhead parking is on your left about half a mile down. 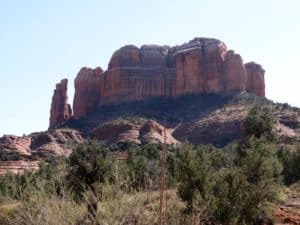 Description: This trail provides a short, less risky alternative to the Cathedral Rock hike (which is really more of a scramble). If you don’t like heights or strenuous hiking, this is the way to go. Templeton is equally scenic, without the danger, and is frequently ignored by Sedona locals and tourists alike. This trail features lush greenery and gorgeous views of Oak Creek. As always, you will also be blessed by some fantastic red rock scenery. If you want a longer hike, you can add on a few additional trails as well. Directions: Follow Rim Shadows Drive for a quarter of a mile. Continue straight onto Canyon Shadows for 300 yards, then arrive at the Soldiers Pass Trailhead parking on your left. Description: This exciting trail is a great place to check out, as it features a number of unique natural features. 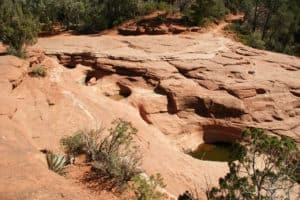 There are seven sacred pools that are carved through the work of nature alone into the sandstone, as well as three natural arches and a sinkhole. These pools are considered sacred by the Apaches and Yavapai tribes, so they are a cultural sight to be seen in their own respect. This trail is long, though close to town, and tends to be less trafficked than some of the other trails. There is no major climbing involved, but the landscape changes frequently. You could have views of leafy wilderness at one moment, and then venture into a wide-open vista with open rock faces the next. The trail has a back country feel without requiring you to drive for hours outside of town. Safe for Kids:Yes, with experienced adult supervision at all times. Directions: Upon arriving at L’Auberge Resort, turn left onto 89A and drive 3.3 miles. Take a right onto Dry Creek Road and travel another 2.9 miles. A left onto Boynton Pass Rd, followed by another 1.6 miles of driving, before you take another left (0.5 miles this time) and arrive at Fay Trailhead. Description: This family friendly-trail is relatively flat, making it a good choice for young feet or for older hikers. The trail offers impressive views of the box canyon, offering views of the red rock cliff walls. It’s also a great place to soak in the local flora and fauna. This trail, in particular, offers exceptional views of native juniper and oak trees. It takes roughly an hour and a half to hike out and back, making it a great option for a quick jaunt. The trail takes you about a mile into the canyon, with an optional side-trip half a mile int hat takes you up a short hill to the arch. The arch is steep and may require the use of hiking poles, but after about a hundred feet of climbing, you will receive some of the area’s most spectacular views. Directions: Follow Jordan Road for .8 miles before turning left onto W. Park Ridge Rd. Follow this for another .7 miles, most of which is dirt. 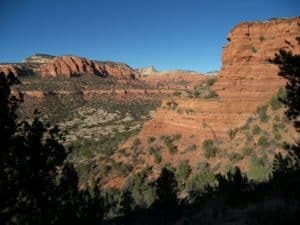 Description: Brins Mesa is a unique trail that takes you up over 500 feet to a mesa that overlooks Mormon Canyon and Soldiers Pass. You can add an additional side trail to tack on another mile and four hundred feet of elevation, or make this a stand-alone adventure. Either way, you will have one of-a-kind views at the top of the mesa, which overlooks the Secret Canyon Wilderness. This wilderness area is one of the most secluded areas around. The trail also boasts a small red rock knoll that provides a perfect perch to enjoy some panoramic views. Safe for Kids: Yes, but bring plenty of snacks and water! Directions: Follow Dry Creek Road for 2.9 miles. Take a left onto Boynton Pass Road, then follow for an additional 1.6 miles. Turn right at Boynton Canyon Road, where parking is on your right. Description: This trail is a bit longer than the rest, but offers one of the most relaxing hikes in the entire state of Arizona. The elevation varies, making it possible for you to view open red rocks at one minute and snow the next. You will spot a variety of local plant and wildlife here, including epic ponderosa pines and shy black bears. This hike offers constant views, and is one of many Sedona trails that leads to a vortex site. The others are Cathedral Rock, Bell Rock, and Airport Mesa, all of which can viewed on this Sedona vortex map. Even if you don’t have time to check out the other vortex hikes, Boynton Canyon is a great place to experience the masculine and feminine energies that are well-balanced in this area. The trails are rich in Native American history and sacred customs, and legend has it that this trail in particular is the birthplace of the Yavapai and Apache tribes. The hike is paradoxically both energizing and calming, allowing you to rise to the top of a quasi-plateau that sits just above the tree tops. Directions: Upon arriving at Morgan Road, take this for about .6 miles. You’ll follow an additional dirt road another tenth of a mile. Parking is on your left. Description: This trail only takes about two hours to hike, and boy, is it worth it! It is often overlooked by hikers because it is also a Jeep trail. However, the rugged trail is able to respond well to the traffic, and is not as eroded as you might think. Enjoy the magnificent scenery of the red rock cliffs and canyons as you make your way along the trail. It also links to additional trails like Chapel, Bell Rock, Little Horse, Submarine Rock, and Llama. Some of these offshoots provide you with panoramic views, while others give you extended canyon observation areas and the opportunity to soak in some truly impressive spires. Another interesting fact? This trailhead is so diverse and popular that many old western films were shot here. See if you can spot any of the backdrops from your favorite films while you hike! Directions: Start at L’Auberge Resort and turn left onto 89A. Follow this for a quarter of a mile before turning left onto Highway 179. Follow this another 4.7 miles, going through four roundabouts, before you arrive at the Courthouse Vista Parking lot. Take this an additional 1.1 miles to Bell Rock Vista Parking. The trailhead is on your left. Description: This mild-to-moderate hike is fun for the whole family, offering you excellent views and a scenic, tranquil experience. 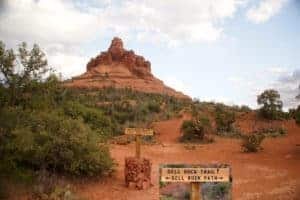 This hike gets overlooked by many hikers, who want to avoid the crowds of people at Bell Rock Sedona. Bell Rock is certainly a great spot to stop and take photographs, but you cannot visit this spot without a hike to Courthouse Butte. Do the entire loop. The Courthouse is remarkably calm, and Bell Rock allows you to bring out your inner child. This is a steep hike, but a top choice for many locals. When you hike it, you can take the Courthouse Loop or take the Big Park Loop. The Big Park Loop moves around the eastern and northern sides of the butte, and includes a cluster of Ocotillo just below the smaller butte. Directions: From L’Auberge Resort, turn left onto 89A and follow for 3.3 miles. A right onto Dry Creek Road, followed by another 2.9 miles, will lead you to Boynton Pass Road. Follow this for another 2.8 miles (there will be one additional left hand turn during this time, but stay on Boynton Pass Road). Parking for the trailhead is on your left. Description: This unique and challenging hike is a great option for a quick (yet steep!) excursion. To get there, you need to climb a little under a mile to the top of a mesa. You’ll be rewarded with excellent views the entire way up, and with even more gorgeous scenery once you reach the top. 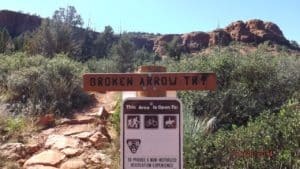 This trail is surprisingly uncrowded at most times of the year, but offers panoramic views of dozens of Sedona landmarks. This is also a great spot to watch the sunset. Since all you need to do to have unobstructed 360 degree views is to cross a few rock cairns, it’s easy to get to this spot just as the sun is going down. Since it’s a short hike back to your car, you don’t have to worry about stumbling around for too long in the dark, either. Sedona is a spectacular time to visit, no matter the time of year. Spring and fall are the most popular months to visit, with daily highs in the high seventies and nighttime temperatures hovering around 30 degrees. The area is very dry, so you likely will not need to bring an umbrella. Exercise caution if you are visiting in July or August, as this is “monsoon” season. You may get caught in a brief but intense period of heavy rain that can be drenching and involve some dangerous thunder and lightning. Summer time in Sedona is also oppressively hot, with temperatures averaging ninety degrees or higher most days. Snow is rare in Sedona, but the area does experience seasonal changes and hosts some pretty impressive foliage in October and November. Regardless of the time of year in which you are hiking, you should always bring a good, updated map of the area, as well as enough water to last you the entire day. A hydration backpack is always a good idea, as you can stash other essentials, like a first aid kit and extra clothing, in there if necessary. Bring plenty of snacks and wear durable footwear. Hiking boots are always best, but the trails are well-maintained and clearly marked so that you may be able to get by with a good pair running shoes, preferably a pair of good hiking shoes. After a long day out on the Sedona hiking trails, you no doubt want to sit back and relax in style. Depending on your style and budget, there are dozens of places you can stay, eat, and enjoy the local culture. Briar Patch Inn is one of many Sedona bed and breakfasts, offering visitors healthy breakfasts of home baked breads, eggs, and herbal teas – and that’s just a sampling of items from their delicious, varied menu! You’ll be more than fueled enough to tackle any Sedona hike with that kind of breakfast. If you’re looking for a more upscale experience, consider one of the many Sedona hotels. L’Auberge de Sedona is an upscale resort and spa, and gives visitors the opportunity to enjoy both the wilds of Sedona along with the more posh necessities for a calming vacation. No matter where you choose to stay and play in Sedona, this area has plenty to do, see, and experience for any budget or style. Make sure you add Sedona to your bucket list of adventures and don’t forget to add these scenic, jaw-dropping hikes to your list. Final Notes: While we have gone all out with our personal favorites in this article, there are a few other blogs out there who have posted their personal favorites also. It really is a matter of personal preference. 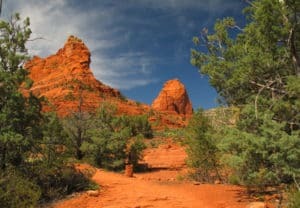 Here is a small list of other awesome blogs covering their top Sedona Hiking Trails. We hope you enjoy reading them!